These acrylic signholders allow your customers to view literature or signs at multiple levels with the ease of gridwall display. Available in numerous sizes. Choose from the options below. 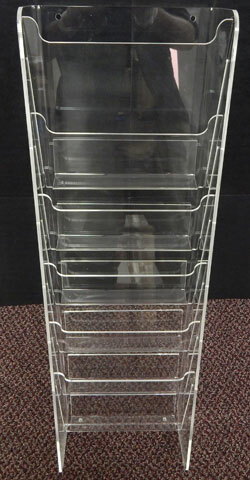 This acrylic brochure holder features 6 separate pockets arranged vertically. Constructed for wall mount display, this brochure holder is available in 2 brochure sizes and is also available for wallmount and gridwall display. 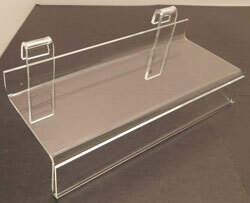 A wide acrylic shelf with a front signholder. 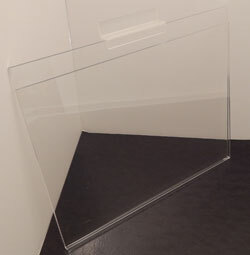 Clear acrylic construction allows attention to remain focused on your product and graphics. Measures 10"w x 4"d.
These acrylic sign holders allow your customers to view signs or literature at multiple levels with the functionality of slatwall. Available in many sizes. Choose from the options below.